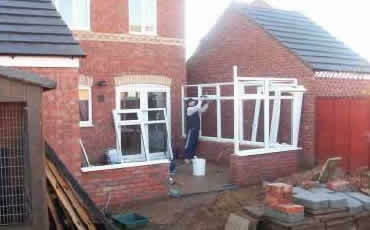 DIY Conservatory - Too Big A Job? Well, maybe if your experience of DIY extends to rewiring plugs, but if you have just a little more experience many of today's self build conservatory suppliers will provide you with full installation guides (for example U-Fit Conservatories provide a guide to your DIY conservatory broken down into easy to read segments each targetted at a specific part of the task). When you look for a DIY conservatory you should be looking for a company that provides all your glazed panels including the conservatory roofing panels, doors with locking mechanisms, all the connectors to attach the panels to each other and to your base or wall, a full guttering kit to ensure proper drainage and a full fixing kit. We know that this sounds like a lot of kit and looks complicated, but if you have put up a self-assembly shed, or have converted your garage to an office, a bespoke self build conservatory shouldn't be that much of a problem. As with all good DIY work, you need a good set of tools, some patience and the practicalality to understand that this isn't a one man job and you will need a second pair of hands for some of the time, alternatively if you think that it is all too much, contacting a builder of conservatories such as Crystal Clear Ideas may be your best option. How Much Is My Conservatory Going to Cost? The easy response to this one is that it will cost a lot less than if you get someone else to do it. We think that is a bit off the cuff, anyway you should be looking at costs from about Â£1,000 for a small lean-to type conservatory, up to many thousands for much larger Victorian style conservatories.